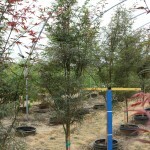 It is an upright, small deciduous tree. 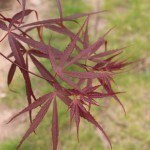 The burgundy red leaves have very long and narrow lobes that are slightly incised. The overall look is of a delicate, willowy red bamboo. The fall color is fiery shades of red and orange. It prefers sun/partial shade in well-drained soil.